Sidewinder Subs Gilbert sub shop is located on the SE corner of McQueen Rd & Elliott Rd in Gilbert, Arizona. We’re open daily from 10am to 5pm. Our phone number is (480) 633-7827 and our fax number is (480) 633-5575. 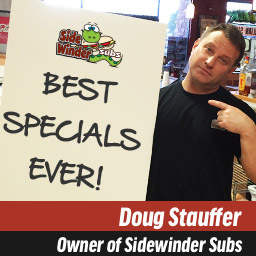 You can also email Doug at doug@sidewindersubs.com.